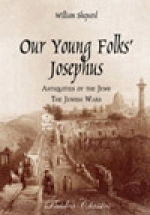 “Our Young Folks’ Josephus” is a simplified retelling of the great historian Flavius Josephus’ epic narratives, “The Antiquities of the Jews” and “The Jewish Wars.” It covers the history of Israel from the time of Abraham until the fall of Jerusalem in A.D. 70, following the Septuagint chronology. This work is an invaluable supplement to the study of Old Testament history, covering a broad period of time in detail, yet at a more manageable pace suitable for the mid-elementary level through middle school. This is the complete book. The MP3 CD, Vol. 1 recorded by Jim Hodges, includes chapters 1-91, Abraham through Esther. The "Story of the Last Days of Jerusalem" is an adaptation of Josephus’ dramatic first-hand account of the fall of Jerusalem in A.D. 70 in his famous historical work, "The Jewish Wars." It captures in detail one of the greatest tragedies of all time, often overlooked in more contemporary histories.